I couldn't afford to spend money on a new shelving system or fancy matching bins. I truly had to work with what I had, so this is a real-life look at an organizing system that I hope will continue to work for us. You can have a beautifully styled closet, but if it doesn't work with your organizational needs you might as well just have chaos. 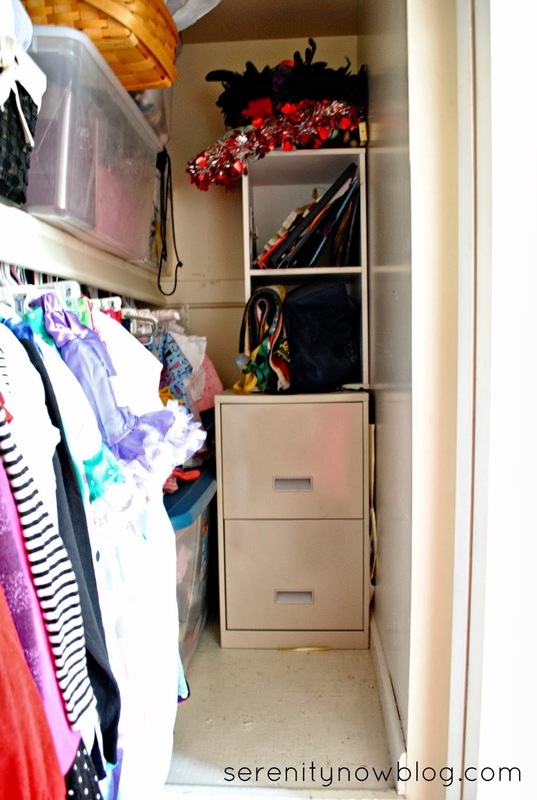 I say "semi-Before" because while this photo shows the original layout of the closet, it truly doesn't show you how awful it was. 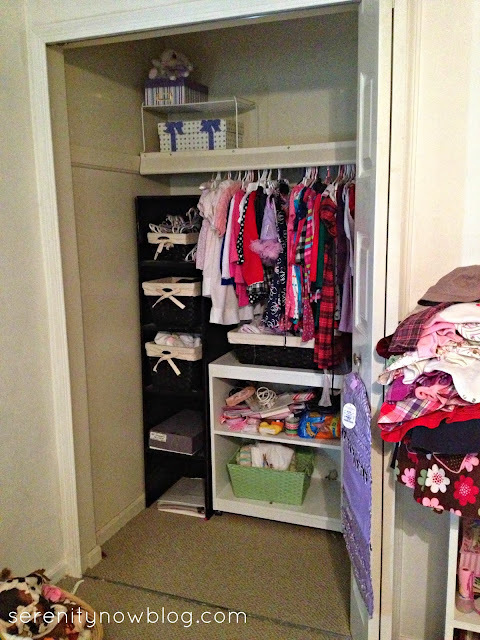 The closet is large, but oddly laid out with a big shelf hump thing. One side had piles of purged clothes and the other side held gift bags and gift wrap. Yep. The black shelving unit, a remnant of my college job at Express, is now housed in the master bedroom closet, and it holds T's shoes. The white rolling cart is also in our room and will be relegated to its original purpose of storing my breast pump and accessories while I need them. 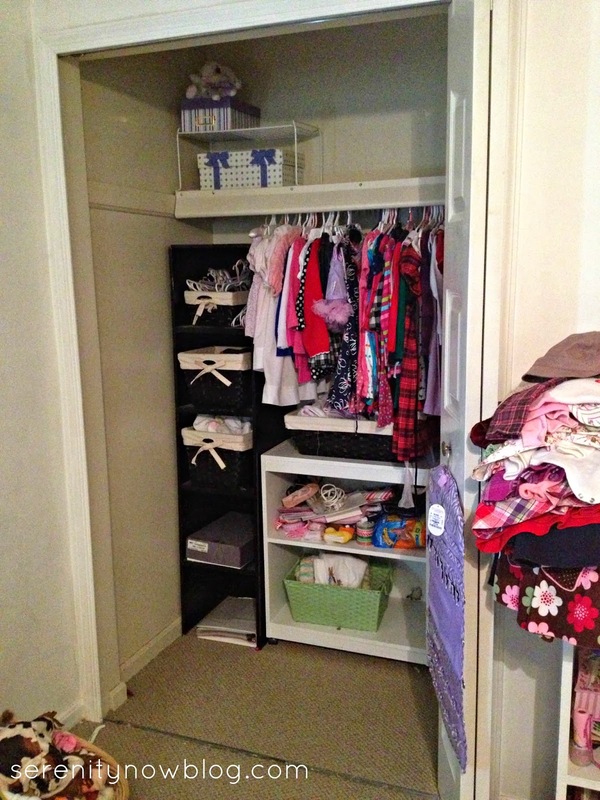 When your home is small and closet space is limited, you have to get creative! The white and gold chest of drawers was my mom's, then mine, and now it belongs to Natalie. Michaela Byrd's long dresser sits under the front window. 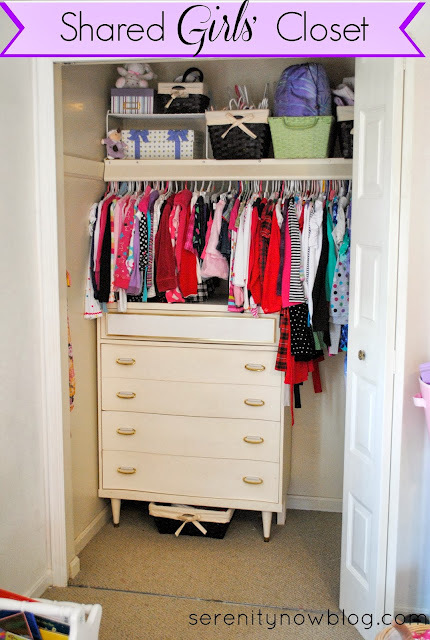 I wanted each girl to have her own dresser, so Natalie's had nowhere to go except the closet! 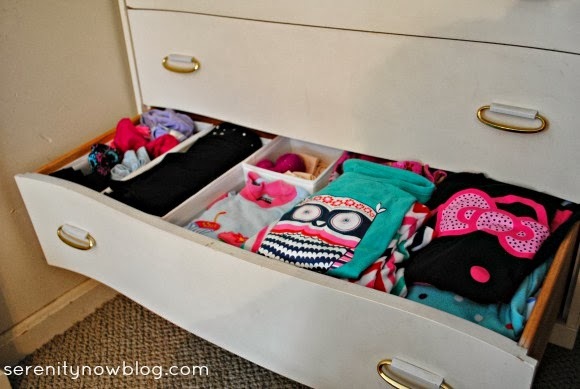 I used some IKEA drawer organizers where I could, but most of the drawers were too shallow for them. On the side of the weird giant closet shelf, I used another Command hook to hang a small jewelry organizer. 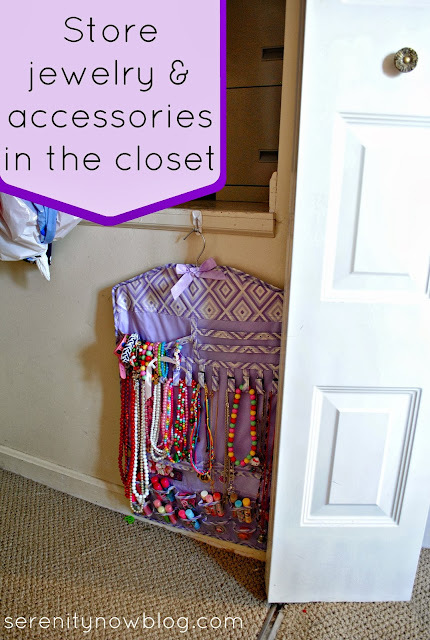 It holds the girls' jewelry and their extensive chapstick collection. 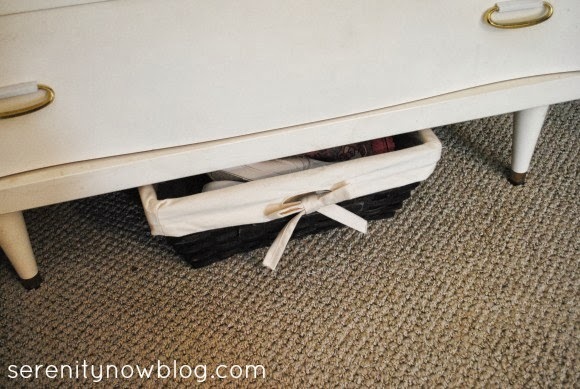 Under the dresser is a long basket with snow boots, rain boots, and a pair of tennis shoes that Natalie will wear with her Halloween costumes. Stuff that doesn't need to be out all the time. 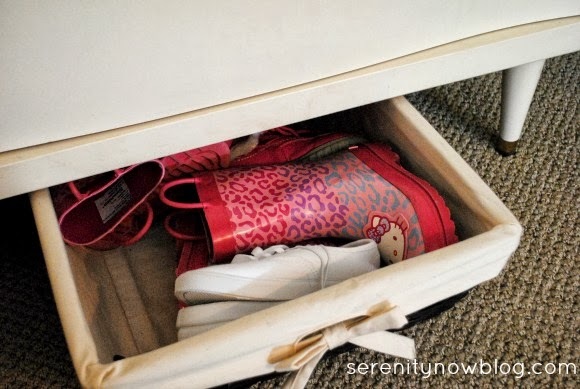 Their every day shoes are in an over-the-door organizer on the door to their room. On top of the weird giant shelf thingie (our stairs run underneath it) is our filing cabinet (nowhere for that baby to go!) a shelf with seasonal flags and wreaths, and a bin with Natalie outgrown clothes waiting for Michaela Byrd to grow into. The striped box on top is empty (always nice to have some extra space), the small black basket holds girls' purses, and the polka dot box has some of Michaela Byrd's special baby things. 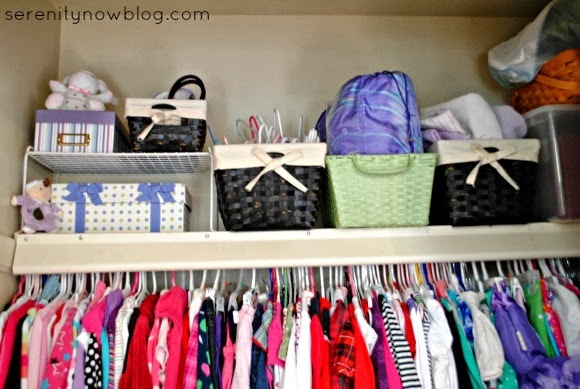 One medium sized black basket holds hangers as clothes are pulled from the rack (no empty hangers clogging up things! 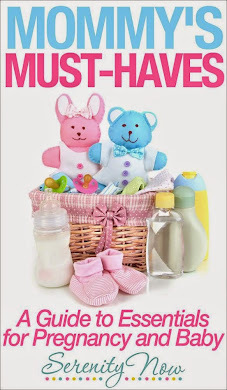 ), the green basket has the girls' sleeping bags inside, and the last black basket stores a few baby blankets that I couldn't part with. The rest of the shelf holds a bin with some of my old Barbie stuff for the kids, a Fisher Price baby toy, and my punch bowl (seldom used, hence the placement in the back of the closet). 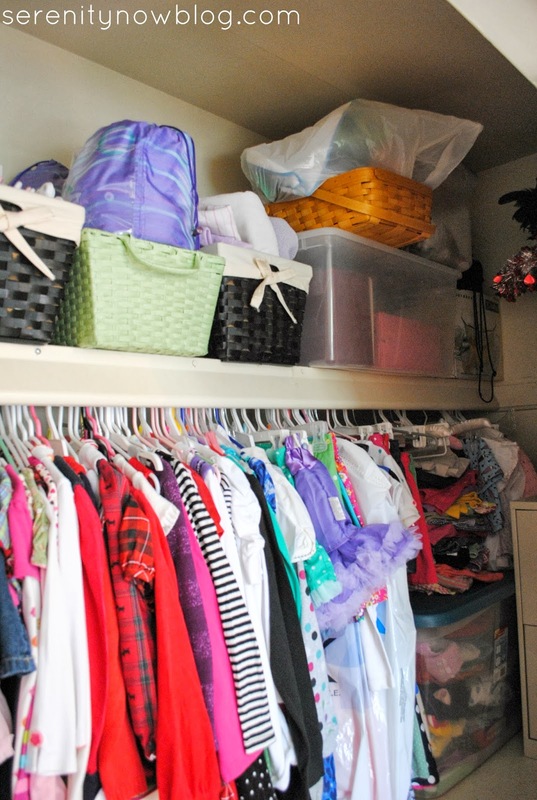 As for the clothes themselves, they are organized, though it may not look like it. With the dresser and a lack of multiple bars, I had to get creative. Michaela Byrd's clothes are on the left and Natalie's on the right. 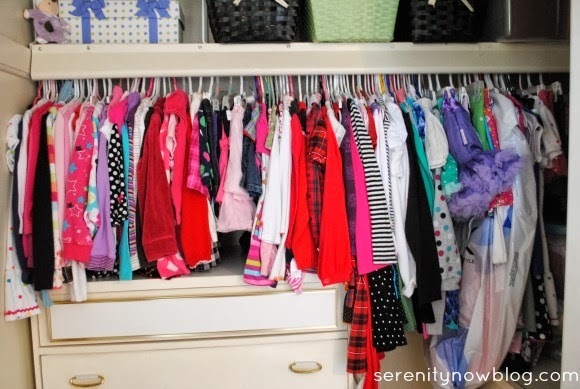 Each girl's clothes are organized from left to right: sweaters and cardigans, sweatshirts (they take up too much room in drawers), long sleeved tops, skirts, and dresses (short to long sleeve). Obviously, it would be ideal to have the top of the dresser clear for more storage, but I had to get two people's clothes to fit in this closet, so this works best for us. This new system has worked very well for us so far, and I'm pleased that I didn't spend a dime to make it happen! 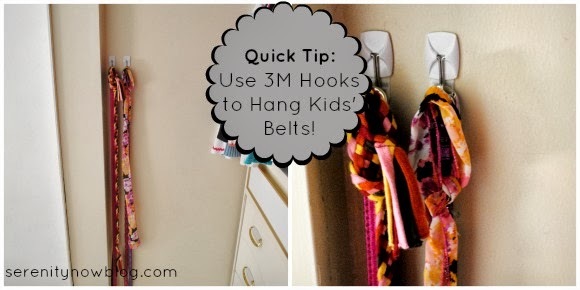 We need new closet doors and I may rig something cute up with fabric, but for now, it is usable...and that's what matters! What projects are you working on in your home? Showcase Your Best Post of the Week-- Link Up! 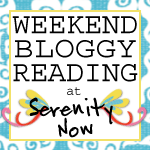 Showcase Your Best Post of the Week--Link Up!